I am not ready for December to come to an end, but writing this post is really forcing me to face the fact that Christmas has come and gone, and gloomy January is looming. I did have a couple more festive pre-Christmas posts planned, but found little time in which to write them, and absolutely no free daylight hours in which to take photos for them. 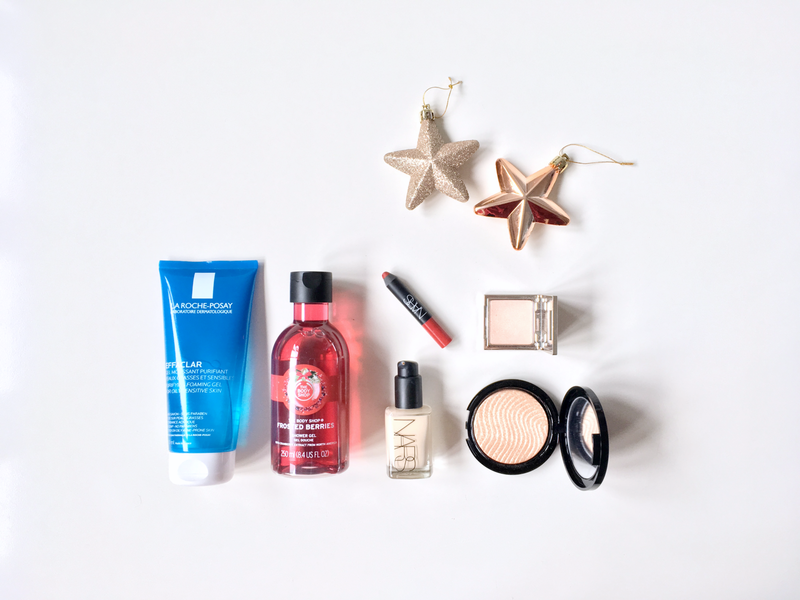 So never mind that... What I have managed to put together is a round-up of my top December beauty picks. I've been experimenting with makeup a lot this month, so haven't been using the same group of products day-to-day, but I do have a few steady inhabitants of my makeup bag worth mentioning, and a couple of non-makeup beauty faves. This was the first high-end foundation I ever bought, and several repurchases later, it's still the best one I've ever tried. It's lightweight, easy to blend, has good medium-buildable coverage, and a really flattering semi-matte finish. It holds up well on my oily skin and doesn't cling to my drier, flaky patches. It also comes in a fantastic range of shades; it's one of very few foundations I'm able to buy in my actual skin colour. It just ticks all the boxes. I could go on with this rave, but I think that about conveys why this has been the only foundation on my face this month. 'Citrine' is a real beauty - probably my favourite makeup discovery of the month. The one you see pictured above is a mini version, as mine came in the limited edition Jouer Powder Highlighter Trio I purchased last month (still available here), but I've listed the price for the full size 'Citrine', which is permanent. To be clear, I love all three of the highlighters in that trio, but I've been reaching for 'Citrine' the most. It's a pale, slightly peachy gold which gives the most beautiful, bright, luminous sheen to the cheeks. The powder is super soft, the shimmer is ultra fine and smooth, and the resulting glow is nothing short of angelic. On the days I haven't been using the Jouer highlighter, I've been reaching for this MUFE one. I mentioned in my last post that I love a true gold highlighter for a Christmas makeup look and sure enough, this has been by go-to for parties. 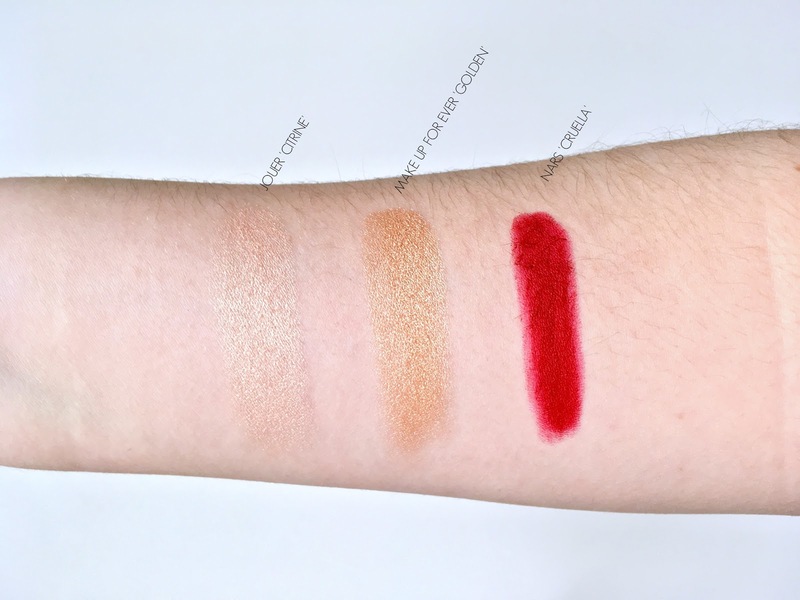 While the Jouer highlighter has a traditional powder formula, the MUFE one has that silky 'gel-powder' formula that gives a more metallic sheen; the glow can get real intense real fast if you go in with a heavy hand. It gives a very smooth, non-chunky sheen though, is very easy to blend, and meshes with the skin beautifully. The shade 'Golden' is definitely aimed at darker skin tones than mine, but I have no problem applying a sheer layer and blending it in with the rest of my makeup. I have so many beautiful festive reds in my lipstick collection... But 'Cruella' has been the only one I've wanted to wear this month. I wore this one on Christmas Day, Boxing Day and every other day I attended any kind of festive celebration/activity. It's my number one favourite red lipstick - a cool, slightly deepened, true-matte red which looks effortlessly glamorous, and holds up pretty well through a hearty meal. Every makeup lover needs a lippie like this in their collection for this time of year. In fact, every makeup lover should have this specific one in their collection at all times. It's the crème de la crème of red lipsticks. Buying at least one thing from The Body Shop's Christmas range has become a bit of a festive tradition for me, and this year I'm loving the Frosted Berries scent. I'm a big fan of perky, fruity scents like this, and as far as shower gels go, The Body Shop ones are pretty darn pleasant. Stepping out of the shower smelling like this is one of those little December daily occurrences that make me think: "Yep, it's Christmas." Like opening the next door on my advent calendar or seeing the latest John Lewis Christmas ad on TV. What were your beauty faves this month?